What? Now we have to replace the sewer to “code”? Yep, that is a permit’s requirements. These fussy cities, what do you do? I’m pretty much by the book, the home improvement book that is. So reading about any type of building task is supposed to translate into knowledge to perform that task. I’m not new to plumbing having moved toilets, installed tubs, and built new bathrooms. 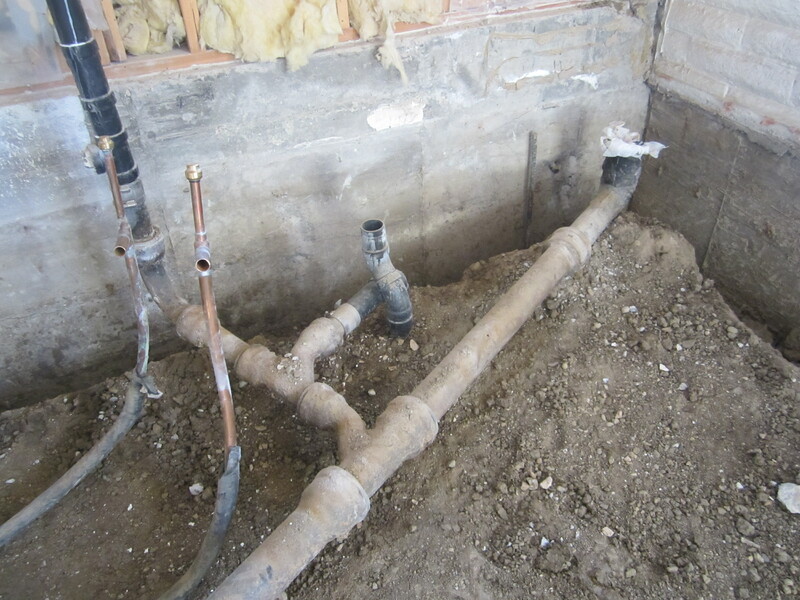 But these tasks pale in comparison to the sewer requirements of the 2009 International Plumbing Code. To back up my plans, I turned to home improvement forums, where expert will answer any type of building questions, depending on the forum. The first question I had was about the required depth of the new pipe. The slant of the pipe is obvious, but ours starts high, just under the slab, to get the required slant, and I thought I read somewhere that the start had to be 12″ below the slab. The forum was not a help with this question. However, the city helped clear this up by the plumbing inspector who called me back at 6 pm on a Friday night after getting back to the office. (Who complains about public employees again?) No, I would not have to change the elevation of the pipes. Whew. Oh but what else do I have to do? Well, apparently the existing plumbing in the bathrooms could not have been to code, well, maybe code in 1980. There does not seem to be proper venting. 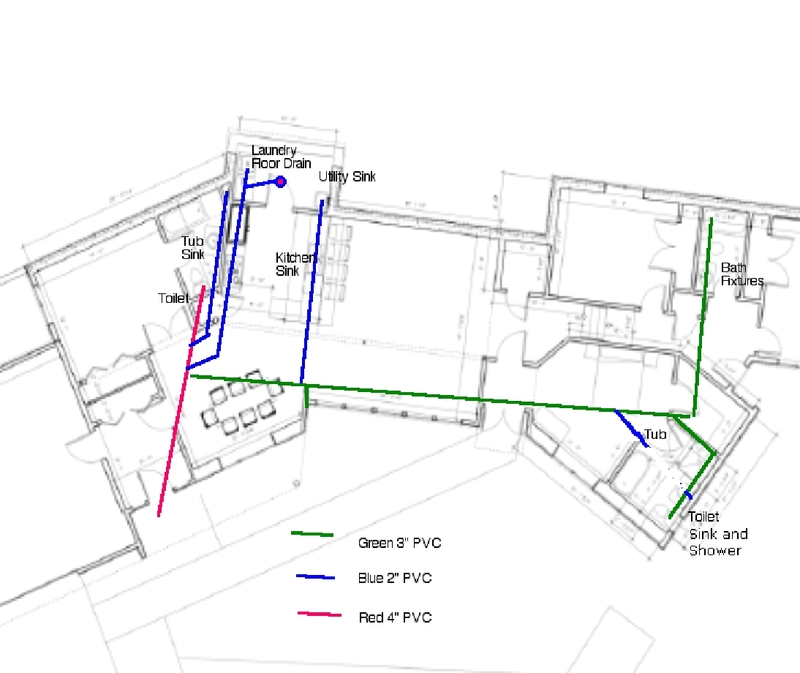 Master Bath Pipes–Toilet is not vented before shower? So it has been an issue trying to figure out how to layout the master bath. 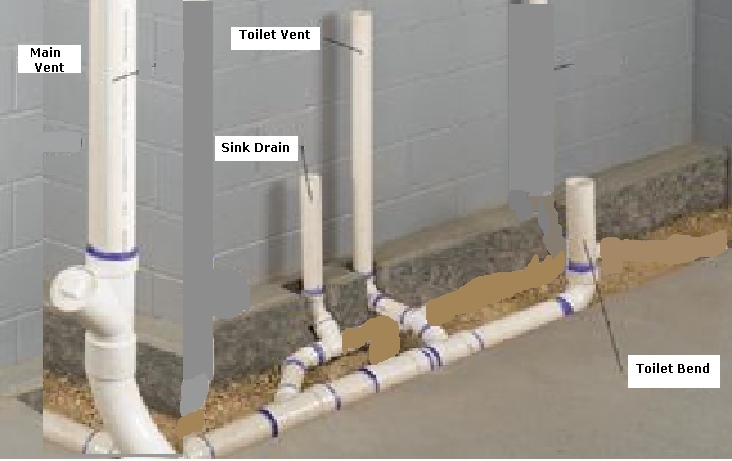 This is the idea for the drains–it is the vents that are confusing. What actually IS required? Floor plan showing drains by size. Seems like this will work, the issue is with the venting. There SEEMS to be a rule that a vent is necessary before any other fixture is placed on the drain. 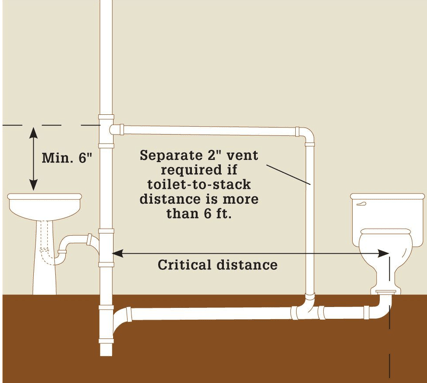 This diagram is for a toilet that is more that six feet from the main vent. Plumbing toilet vent. looks simple right? I revised this plumbing diagram from a Black and Decker plumbing book for our master bath fixtures. In the book the vent for the toilet that is placed between the toilet and the sink. Plumbing Diagram from Black and Decker book. 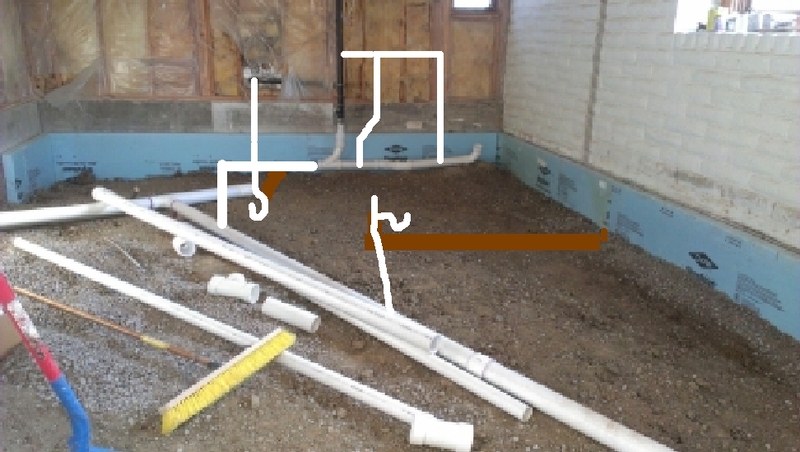 In this plumbing plan drawn onto the newly installed sewer pipes, the plan includes a vent for the toilet before the sink. I could NOT get verification that the dry toilet vent was necessary on the forum. Instead I was told it was not necessary but that the fittings were wrong and all matter of other things that looked wrong but are not, as they assumed the wye’s were forbidden sanitary tees etc. (most common mistake apparently) One helpful idea was to run the whole toilet pipe close to the wall and use a wye at the point that it connects back to the toilet instead of the 90 degree sweep I guess. Have to think about that one before Alberto’s crew starts gluing next week!